The House of Representatives has resolved to set up an ad-hoc committee to investigate the total amount recovered from the Abacha loot from 1998 to date. This is one of the four resolutions made by members of the lower chamber after a long deliberation. The resolutions were sequel to a motion of urgent national importance sponsored by Karimi Sunday. 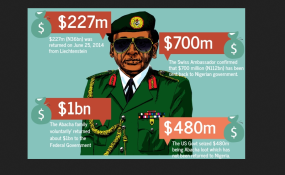 Mr Sunday had explained that the Abacha family in 2014 entered an agreement with the federal government, forfeiting public funds in several billions of dollars to the federal government, following a plea bargaining to drop charges against the late military ruler's son. He said the funds have been released to the Federation in several tranches by Switzerland Government but without much disclosure to the public by government. Recently, the Attorney General of the Federation, Abubakar Malami, signed an agreement on behalf of the federal government on the release of the last tranche of $322million to Nigeria. The Special Adviser to the President on' Justice Reforms, Juliet lbekaku-Nwagwu, was reported to have said that in line with the Memorandum of Understanding signed by the Switzerland Government and the Nigerian Government, the $322 million will be paid directly to the accounts of the poorest Nigerians without recourse to the National Assembly. Mr Sunday, however, said by virtue of Section 12 (1) of the Constitution of the Federal Republic of Nigeria 1999 (as amended), no treaty between the Federal Government of Nigeria and any other country shall have the force of law except to the extent to which such treaty has been enacted by the.National Assembly. "Consequently, no agreement or Memorandum of Understanding purportedly signed by the Federal Government with the Switzerland Government can have any force of law in Nigeria, except approved and enacted by the National Assembly," he said. He further said by virtue of Section 80 (1-3) and 81 of the Constitution of the Federal Republic of Nigeria (as amended) a revenue raised and received by the federal government shall be paid to the Consolidated Revenue Fund. "Section 80(3) stipulates that no such monies raised shall be withdrawn from the Consolidated Revenue Fund unless the issue of such funds has been authorised by the National Assembly. As a result, no monies can be paid or expended without National Assembly approval," he said. He called on the federal government to come up with a Supplementary Appropriation Bill, earmarking the funds due to it from the Abacha loot for the completion of the Ajaokuta Steel Complex/Project. Mr Karimi frowned at the decision of the federal government to distribute the money among poor families in the country, describing it as a breach of the constitution. "How many poor families have been identified? Let's follow the laws of the land. This is impunity and has to be stopped," he said. In his contribution, Hassan Saleh supported the motion as he urged the federal government to invest the recovered loot into the Ajaokuta Steel Company. He described the government's decision as corruption in disguise and said the money cannot be properly distributed among poor families. He also wondered what happens if the government cannot feed the poor families tomorrow. Abdumumin Jibrin, on his part, said although he understands the federal government has the nation's best interest at heart, "there is nothing wrong with consulting the National Assembly" as regards what should be done with the money. He called for thorough investigation into the recovered funds and urged his colleagues not to politicise the issue. While stating that money recovered be invested in the Ajaokuta Company, he also urged the House to "deal with the motion in isolation." The House thereafter resolved to establish sources of the money recovered and if at all, charges paid to lawyers and consultants. It also resolved to find out if procedures were followed and identify if agreements entered aligns with Nigeria's constitution.